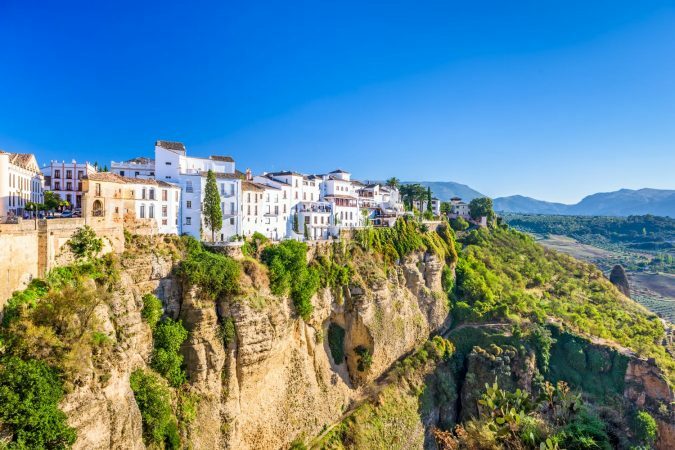 Spain’s capital city has nearly everything you could want in an amazing vacation. From architecture that looks like its right out of a fairytale to a variety of unique neighborhoods to explore, you should never pass up a chance to visit this amazing city. The energy is contagious, the people are friendly, and the sights are amazing. While some people may spend a week or two here, we’re here to help you experience the best of Madrid in 3 days. In this Madrid itinerary you’ll find everything you need to know to take advantage of the best Madrid has to offer. Your adventure will (likely) begin at Adolfo Suárez Madrid–Barajas Airport, unless you’re taking the train, then you’ll arrive at Atocha in the city center. Also known as Madrid–Barajas, the airport is about 7.5 miles (or 12 kilometers) outside of the city center, and it’s super well-connected to the city. There are several different ways to get from the airport to the city center, it’s just a matter of your preference. One thing to keep in mind is that Madrid–Barajas is huge. It’s one of the biggest airports (by area) in Europe, just about the size of Charles de Gaulle Airport in Paris. There are four terminals, and based on the terminal you arrive at, that may affect the way you choose to get into the city, at least it did when I lived there. Terminals one, two, and three are connected, but terminal four is in a separate building. Taxis are typically most convenient if your luggage is heavy or you have a lot of baggage, but if you only have a travel backpack or carry-on luggage, then you may want to save some money and go with one of the public transport options. Taking a taxi is the easiest way to get from the airport to the city center. You’ll pay a flat rate of €30 to get from the airport to anywhere in the city center, and the time will depend on traffic. Regardless of which terminal you arrive in, there should be a line of taxis waiting outside of the door. Most taxi drivers accept cash and credit, but if you don’t have euros, be sure to ask your driver whether they accept credit cards before you get in. The taxis are all cars that fit four people. If you’re traveling with a group or have lots of luggage, you may need to take separate taxi cabs. 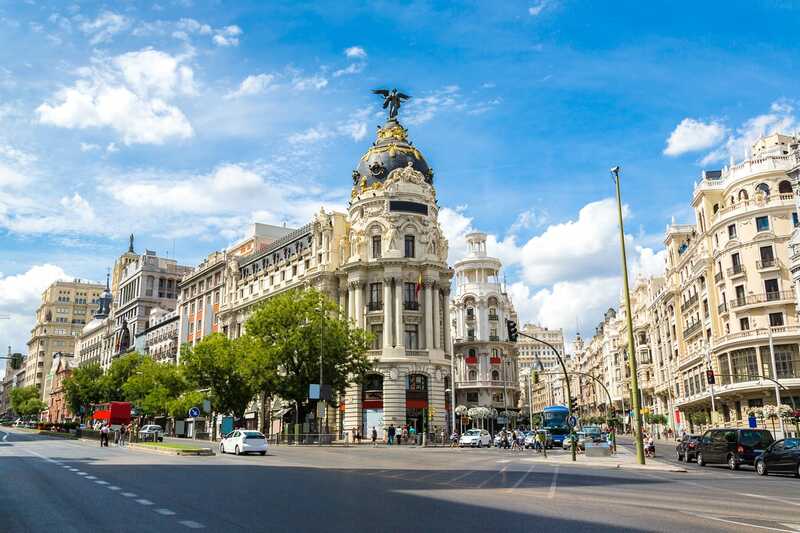 This Madrid itinerary can be accomplished by foot or by metro, but if you’re not a huge fan of walking or public transportation then I recommend you download the MyTaxi app, so you can quickly order a cab whenever you want. From the airport you can take the metro line 8 to the end of the line (the Nuevos Ministerios stop). From there you can connect to metro lines 6 or 10, or to one of the train lines, and you can get pretty much wherever you need to go in the city. The metro runs from 6:05 am – 2:00 am every day. Unfortunately, the pricing can be a bit complicated, but long story short, there is a €3 airport supplement. All metro trips within the city (zone A) will be between €1.50 – €2 depending on the number of stops. To get from the airport to the city on the metro, you’ll pay between €4.50 – €5. There are plenty of machines to help you get your ticket(s), and there are typically employees around at the airport metro stop if you have an issue. If you’re not familiar with Spanish, click on the flag on the bottom of the screen and choose your prefered language. Choose your final destination then you can pay by cash or credit card (some machines only accept credit cards and others only accept cash). You also have the option of purchasing a 10-trip ticket for €12.20 that you can use for the metros, trams, and EMT buses (with the exception of the airport express bus). The 10-trip ticket doesn’t include the airport supplement cost. The train (or “cercanías”) only stops at terminal 4, not 1 through 3. If you land between 6:00am and 11:00pm, the train might be the easiest way for you to get to the city center. It tends to be more comfortable and less crowded. Nuevos Ministerios is only the third stop from the airport, and the train also directly connects you to major stops like Atocha, Méndez Álvaro, and Príncipe Pío. A one-way train ticket is €2.60 (you must use the ticket within two hours of purchasing it) and a roundtrip ticket is €5.20. The machines typically take cash or credit. Keep in mind that the train (Renfe) tickets and metro tickets are not interchangeable. There are a few buses that stop at the airport, but typically the only time when the bus is most convenient is when you land after the metro stops running for the night. The airport express shuttle runs 24 hours a day. The only catch is you have to pay cash, and it costs €5 for a one-way ticket. The 24-hour airport express bus will stop near the O’Donnell metro stop (line 6), at Plaza de Cibeles, and next to the Atocha train station. EMT buses 200 (T1 – T4 arrivals to Avenida de América) and 101 (T1 – T3 arrivals to Canillejas) also stop at the airport, but don’t run 24 hours. Single tickets for these buses are €1.50. For the buses, you will give the driver cash when you board (try to have the smallest notes possible to ensure you get your proper change). Unless you don’t mind extreme heat, I’d probably suggest avoiding July and August. Even some Madrileños leave Madrid during the unbearable summer months. 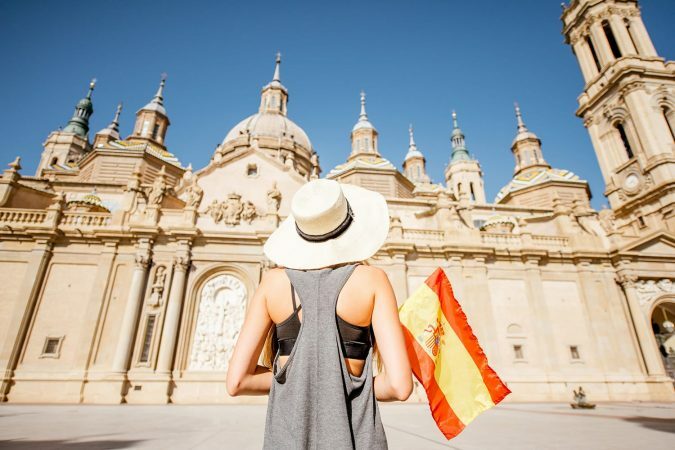 Typically by the time June hits, the temperatures start climbing, so most people would argue that the best time to visit Madrid is typically May or September. Even in the winter, Madrid isn’t terribly cold, so if you’re okay bringing along some winter clothes, then you’ll probably save money because there won’t be nearly as many tourists and things can be cheaper. The only thing about the winter is that the sun sets much earlier. If you visit during the summer months, the sun doesn’t set until around 10:00pm. 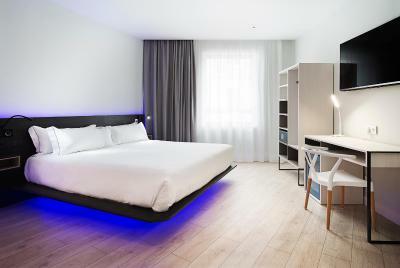 There are several different types of accommodation in Madrid, ranging from amazing hostels to unique boutique hotels. Because you’re only spending three days in Madrid, location is essential. Here are some of the best places to stay in Madrid. Only 500 feet from the Atocha train station, this upscale hotel offers two restaurants/bars, a bakery, and a 24-hour gym. Some upgraded rooms even offer balconies and skyline views. Only a minute’s walk from the Sol metro station, this hotel is on a pedestrian street surrounded by all types of stores and restaurants. This elegant hotel even offers a lovely lounge where you can chill out and grab coffee and tea 24/7. 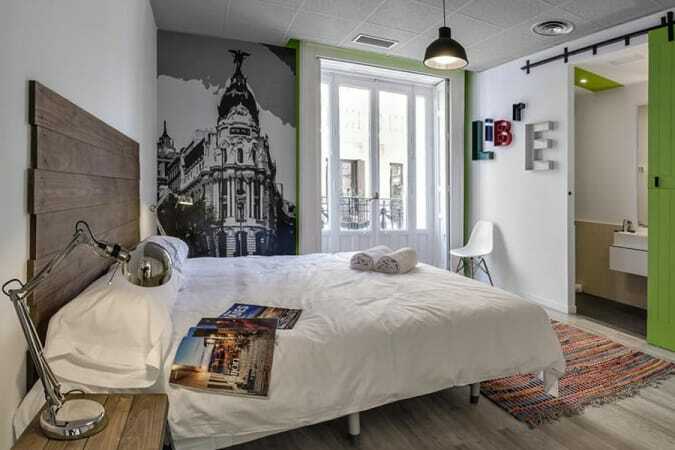 A one-minute walk from the Tirso de Molina metro station, Way Hostel offers colorful dorms as well as private rooms. The neighborhood is quiet so you should be able to get a good night’s sleep while still being super close to places like La Latina and Plaza Mayor. 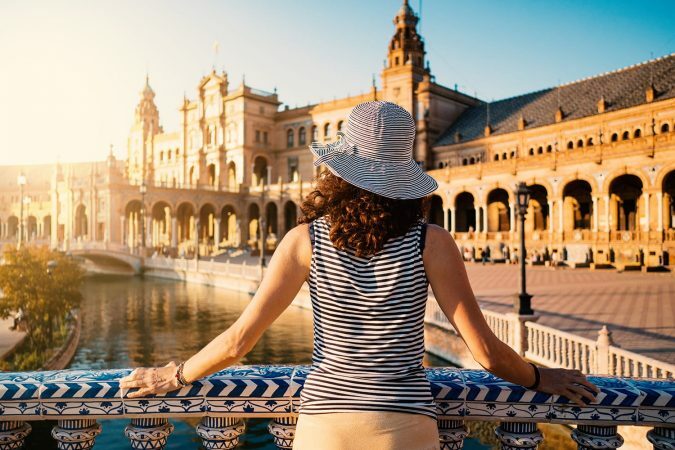 If you’re able to spend more than 3 days in Madrid, you may want to check out their famed free tours to learn more about the city. Known as Madrid’s best party hostel, you’ll be right near Puerta del Sol and the La Latina neighborhood. There’s a bar downstairs, plus there’s a pub crawl every night of the week. They have different tours/activities throughout the week, but their weekend paella parties are the most popular. While there are definitely some non-native English speaking cities where you’ll find many locals speaking English, Madrid is not one of them. Even in the super touristy places and the American chain restaurants, don’t expect people to speak English. Knowing a few Spanish words and having Google Translate ready on your phone is probably a good idea if you’re not too familiar with the language. Here are a few useful Spanish words/sentences that might come in handy in your 3 days in Madrid. What is your name? – ¿Cómo se llama usted? Nice to meet you. – Mucho gusto. I am fine. – Estoy bien. Excuse me. – Con permiso. I’m sorry. – Lo siento. I do not understand. – Yo no comprendo. With so much going on, it can be super difficult to figure out what to do in Madrid in 3 days. But no worries. We’ve incorporated world-class museums, amazing parks, historic squares, and more, to make sure your time in Madrid is the best it can be. However, before we get to itinerary we just wanted to remind you to purchase travel insurance. You never know what will happen and trust us, you don’t wanna get stuck with thousands of dollars in medical bills. As a wise man once said, “If you can’t afford travel insurance, you can’t afford to travel.” So don’t leave home without it. We recommend World Nomads. Now with that out of the way, let’s get to this Madrid itinerary already! 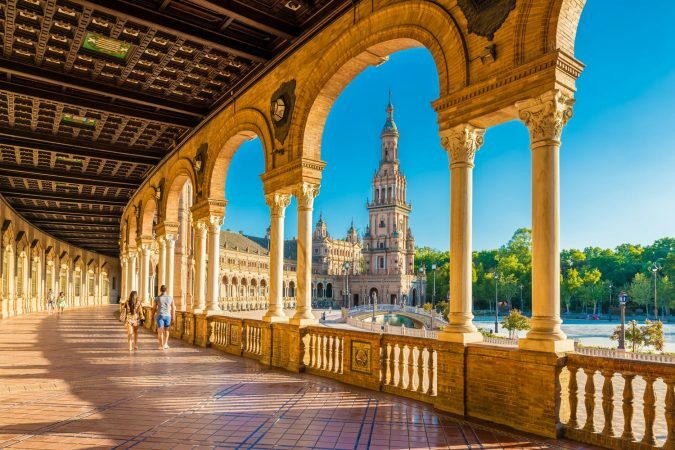 Today you’ll enjoy one of Madrid’s world-class museums, take some time to relax in one of the city’s most popular parks, then wrap up your night with a fun flamenco show. When it comes to the best places to visit in Madrid in 3 days, there’s no way the Reina Sofía Museum doesn’t make the list. Highlighted by Picasso’s Guernica, the Museo Nacional Centro de Arte Reina Sofía is Madrid’s national museum of 20th-century art. The museum is ginormous and has around 20,000 pieces of art, including works by Salvador Dalí, Juan Gris, and Joan Miró. You’ll probably spend around three hours in this museum, but you won’t be able to see everything. 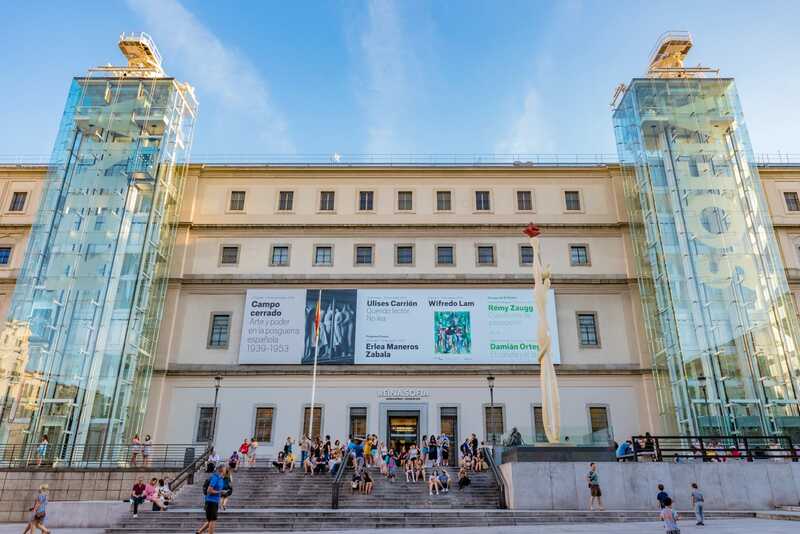 If you’d prefer to be guided through the museum, book your tickets here and a bilingual guide will make sure you experience the best of the Reina Sofía Museum. The museum opens at 10:00am every day (except Tuesdays) and closes at 7:00pm on Sundays and at 9:00pm every other day. If you buy your tickets on their website they’ll cost €8.90, and if you buy them on-site at the box office you’ll pay €10. One of the great things about museums in Madrid is the free days they offer. Mondays and Wednesdays through Saturdays are free from 7:00pm – 9:00pm. Sundays are free from 1:30pm – 7:00pm. Keep in mind that those times are when the crowds are the largest and some exhibitions may be closed. There are several additional free days as well as closed days throughout the year, so be sure to check your dates against the dates on the website before you visit. A 15-20-minute walk or a five-minute drive from the Reina Sofía Museum is one of the largest parks in Madrid, Parque del Buen Retiro. Built as a royal park, you can enjoy it until midnight from April – September and until 10:00pm from October – March. You’ll see people reading, jogging, listening to music, eating, etc. as you stroll through this beautiful park. You can see all types of beautiful monuments and buildings, ranging from the all-glass Crystal Palace to the Monument to Alfonso XII. You can even rent a boat to cruise around on the lake. The boats are typically around €6 during the week and €8 on the weekends and holidays. You can stay here for 30 minutes or for 3 hours, whatever your heart desires. 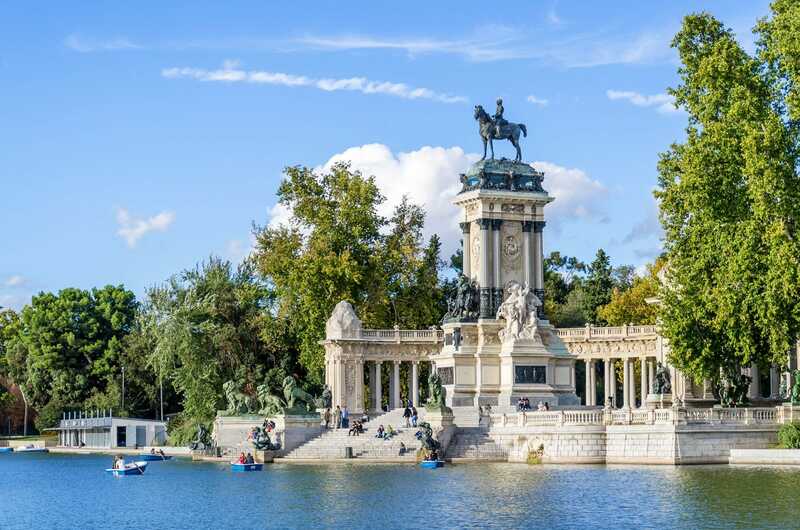 If you’re backpacking through Europe or Spain and doing Madrid in 3 days, Retiro will be the perfect place to take in some fresh air and rest for a little bit. Though it began in the southern Spanish region of Andalucía, if you’ve been dying to see a flamenco show, then Madrid is a great place to be. There are several places you can catch flamenco shows throughout the city, but they’re not all created equal, it all depends on the quality of the artists. One of the most popular shows happens at Las Carboneras, and you can book your tickets here. They have nightly shows, and if you choose this venue, it’s about 15-20 minutes from Retiro Park. All you have to do is take the metro line 2 four stops from Retiro to Opera, then walk a few minutes to the venue. Today you’ll explore some of the most popular historic sites in Madrid then end your evening on one of the city’s most famous streets. 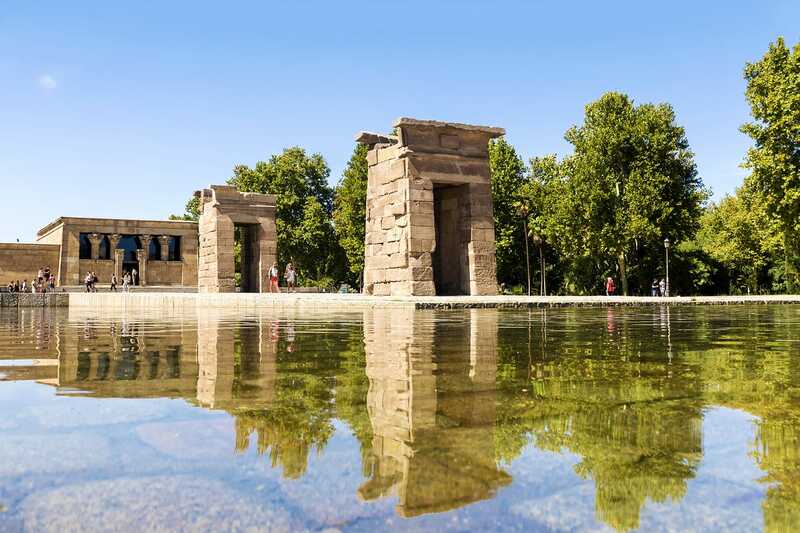 This authentic, Ancient Egyptian temple was actually relocated to the great city of Madrid. Reportedly built around 200 BC, this temple was dedicated to the god Amun of Debod and Isis and was given to Spain in 1968 as a thank you for helping to save the temples of Abu Simbel. Typically open from 10:00am to 8:00pm, be sure to double check the hours before you go because when I visited, the museum was closed due to technical issues. After you’ve finished touring the Templo de Debod, be sure to get some great pictures of the surrounding views. You’ll get amazing pictures around sunrise, but if you’re not an early bird, the sunset views are gorgeous as well. 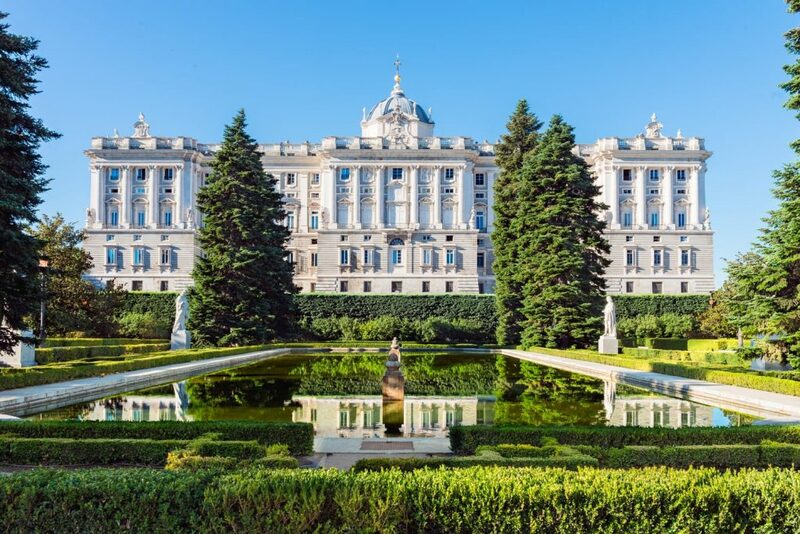 About a 15-minute walk down the street you’ll find the largest royal palace in Western Europe and the biggest building in the city, the Royal Palace of Madrid. Within its 135,000 square meters are 3,418 rooms. Currently only used for state ceremonies, you can visit the palace from 10:00am – 6:00pm during the winter and 10:00am – 8:00pm during the summer. Prices vary based on what you want to see and whether or not you get an audio guide, but admission is free from 6:00pm – 8:00pm between May and September, and from 4:00pm – 6:00pm between October and March. To make sure you don’t miss anything, I’d recommend booking a 90-minute guided tour, but if you’d prefer not to take a tour, you’ll probably spend between two and three hours exploring at your own pace. There’s even a Changing the Guard ceremony every Wednesday and Saturday, weather permitting. After a visit, you’re sure to agree that the Royal Palace is one of the best things to see in Madrid in 3 days. 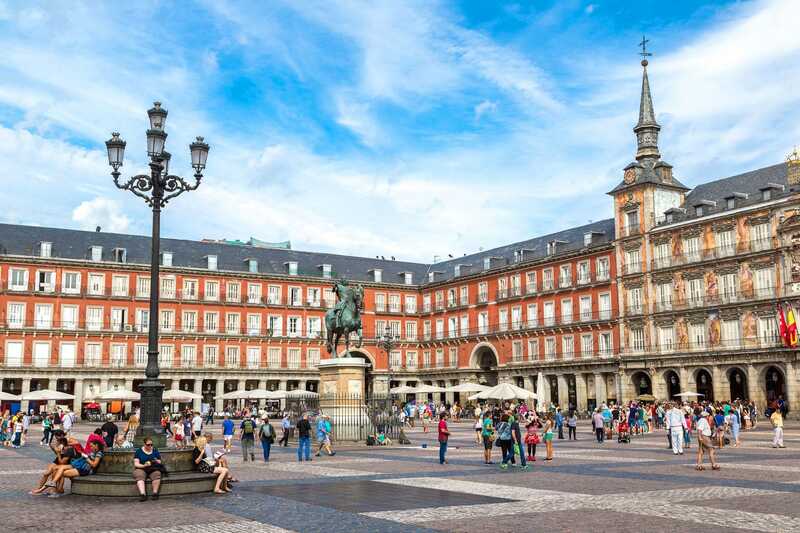 Less than a 10-minute walk from the Royal Palace of Madrid is a historic square boasting more than 400 years of history. It’s always packed with tourists and live performers, plus the architecture is cool to admire and there are plenty of places to grab a bite to eat. In the center of the square you’ll see a 17th-century statue of King Philip III of Spain. You can spend a few minutes here or a few hours. Less than a five-minute walk up Calle Mayor is Madrid’s most famous central square. This is the heart of the city and serves as the measuring point for all of Spain’s major radial roads. 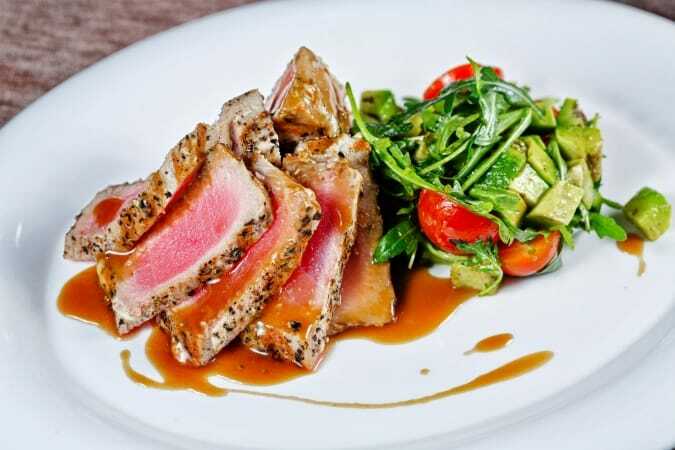 You’ll be surrounded by all types of restaurants and stores, and almost everything in the city is easily accessible from here as there are three metro lines that run through Sol. 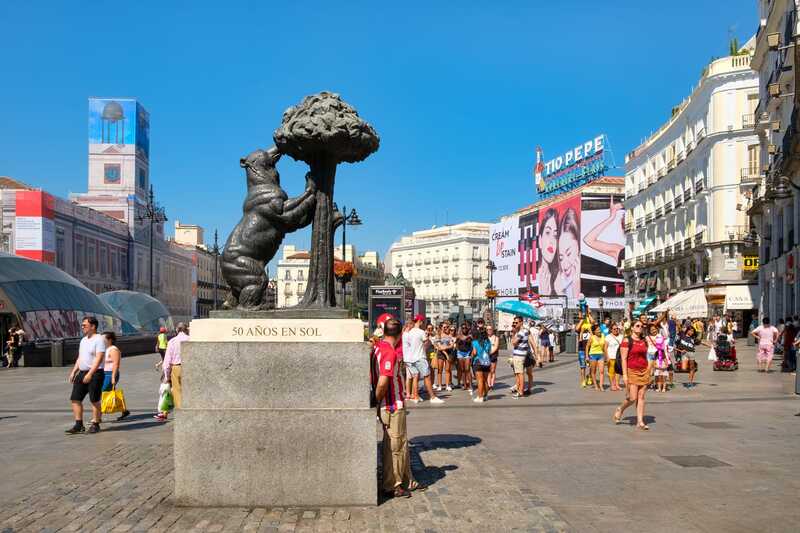 Before you leave this square you have to take a picture with the famous El Oso y El Madroño statue, aka the Statue of the Bear and the Strawberry Tree, which is on nearly every postcard of Madrid. Another five-minute walk will bring you to the famed Gran Vía, and the world is now your oyster. The energy of Gran Vía is infectious and you can do everything from taking in a show like El Rey León (The Lion King) to enjoying the sunset at a rooftop bar then heading to a nightclub. It’s one of Madrid’s most popular tourist streets, so be prepared for it to be crowded, but also take some time to admire the facades and architecture. On your last day in Madrid, get excited for amazing art and impressive sports history before watching the sunset over the city. 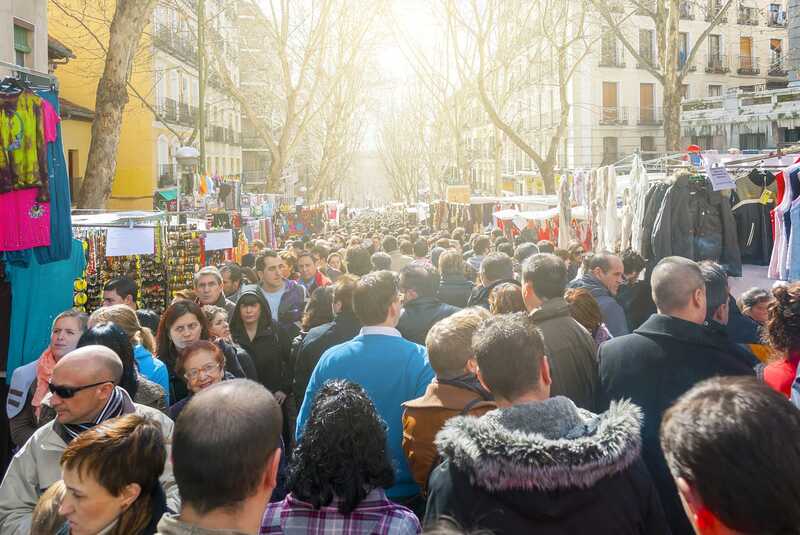 El Rastro de Madrid is a huge open-air market in the La Latina neighborhood that’s open every Sunday and on bank holidays from 9:00am – 3:00pm. If you’re spending the weekend in Madrid, then this market is a great way to start your day. There are hundreds of stands where you can buy everything from clothing and jewelry to paintings and rare books. If you’re not going to be in Madrid on a Sunday or bank holiday, the La Latina neighborhood still deserves a visit. But instead of starting your day here, it’d probably be better to end your day here. This historic neighborhood is one of the most authentic you’ll find, and it’s filled with everything from tapas bars to little churches, it’s even home to one of the largest markets in Madrid, El Mercado de la Cebada. 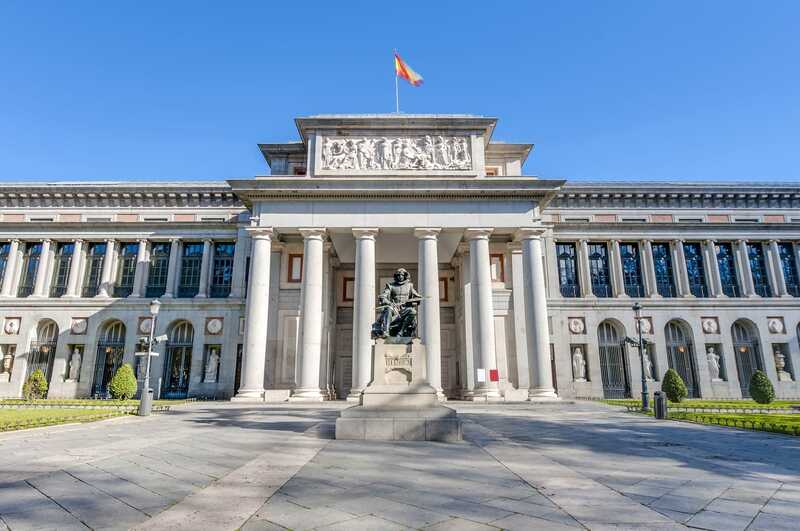 It will probably take you around 20-25 minutes (you can walk or you can take metro line 1 two stops from Tirso de Molina to Atocha if you want to cut down on your walking) to get to the Prado Museum and arguably the greatest collection of European art in the world. Works by Francisco Goya, El Greco, and Diego Velázquez are the highlights here and the entire collection comprises around 8,200 drawings, 7,600 paintings, 4,800 prints, and 1,000 sculptures. One of the largest and most popular museums in the city, it’s wise to book your skip-the-line tickets in advance so you don’t waste your whole day standing in line. If you’re more of a guided tour person, then book your tickets here to be taken through this impressive museum by a bilingual guide. The museum is open from 10:00am – 8:00pm Monday – Saturday and from 10:00am – 7:00pm on Sundays and holidays. There are certain days the museum is closed or has reduced hours, so be sure to double check the opening hours for the day you want to go. Museum entry is €15, but if you want to change around your itinerary, the museum is free for its last two opening hours each day. 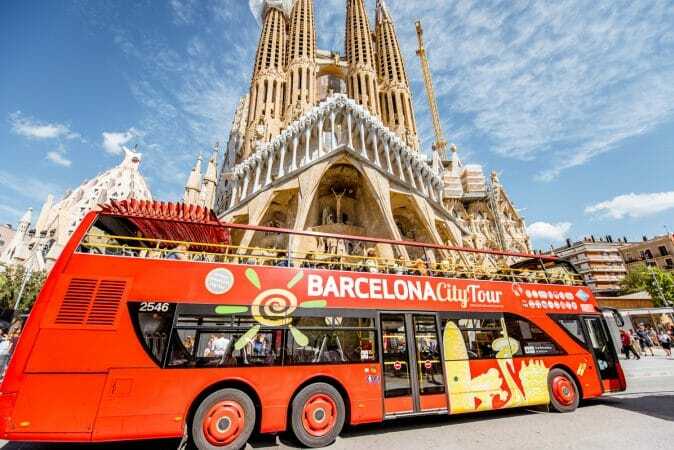 From the Prado Museum, you can catch the 27 bus (15 stops – about 25 minutes) or take a 10-15-minute taxi ride to one of the most famous soccer stadiums in the world and the home stadium of the Real Madrid Football Club. Touring the stadium includes everything from the field to the locker rooms, and it takes around 90 minutes. Adults tickets for a guided tour are €32, adults tickets for an interactive audio guide tour are €23, and non-guided adult tour tickets are €18. The route is the same whether you choose a guided or non-guided tour. You can enter until 7:00pm Monday – Saturday and until 6:30pm on Sundays and holidays. 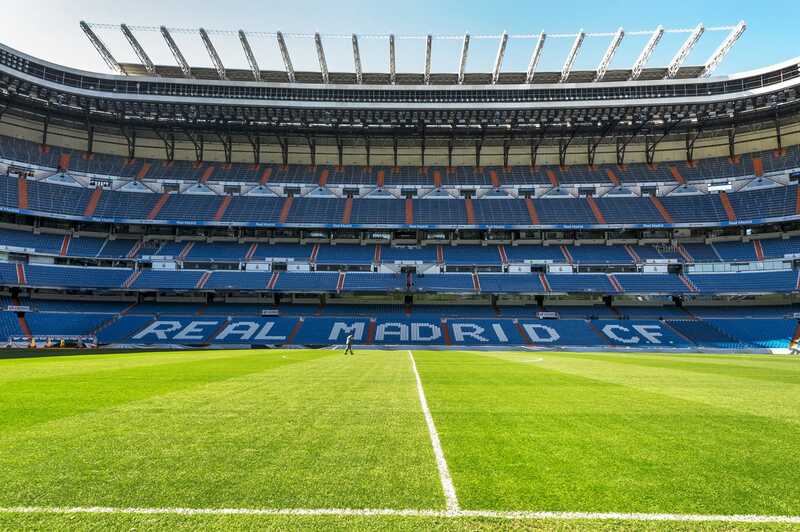 Especially if you’re visiting during soccer season, be mindful of whether or not Real Madrid has a match that day. If you visit on a match day, you can tour the stadium until 5 hours before game time, but you won’t be able to see the locker rooms. If you take the line 10 metro six stops from Santiago Bernabéu to Príncipe Pío, you’ll be a 10-15-minute walk from the Teleférico de Madrid, or the Madrid Cable Car. 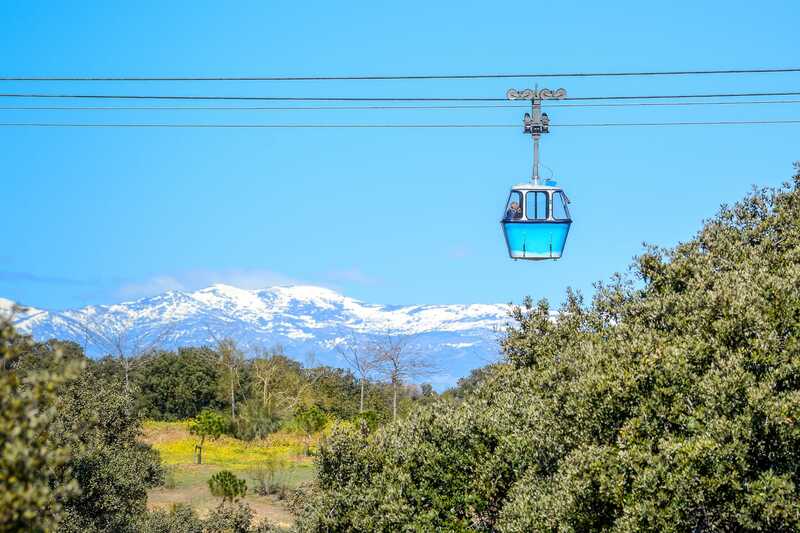 The cable car ride will take you 2,457 meters from Parque del Oeste over some of Madrid’s best sights to Casa de Campo in about 11 minutes. Casa de Campo is a great place to take pictures, enjoy the park, and grab a snack. The cable car hours change every month, so this is another attraction where you should be sure to contact them or check the website before you visit. A one-way ticket costs €4.50, while a roundtrip ticket is €6 (you should be able to pay with cash or credit). The best time to do this is at sunset as you’ll get a great perspective of the city as well as views of the river and Casa de Campo park. We know it’s impossible to visit all of Madrid in three days, but we’re confident that this itinerary lets you get an unforgettable taste of the best of this city.